David Kaufman, M.D., had a good life—he was married to a woman he loved. He had two adult children, a teenager, and a fulfilling career as a radiologist. But, as years passed, he began to realize something about himself—he was gay. Many married men have found themselves in this position—they wanted to marry and have a family, hoping they could ignore their feelings of attraction to other men. However, David soon realized that he could no longer deny who he was. But, before he could tell his wife, Cathy, she told him she needed to speak to him about an important issue. It was then that she she confided in him that she had accepted the growing awareness that she was gay. David was surprised, but her announcement made it easier for him to tell her that he, too, was gay. They came out to family and friends together. David and Cathy separated, but remained best friends, helping each other on their separate journeys into new lives. 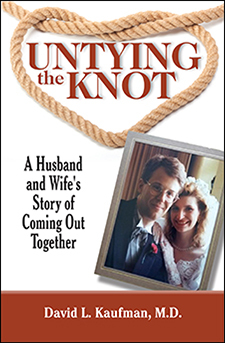 In Untying the Knot, David Kaufman shares the unique story of their coming out. Read the author’s blog post at The Huffington Post here.